Our top picks for bass fishing best lures which consistently catch bass all throughout the year are right here. What lures are you using to catch bass? Largemouth bass, spotted bass, Florida strain bass, Alabama bass, shoal bass, smallmouth bass...? Here are the top 5 fishing lures for catching bass. More bass are caught on plastic worms than any other artificial lure and live bait combined. This alone makes it our #1 top pick for bass fishing best lures. 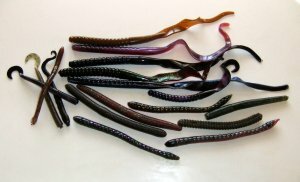 It's well known that plastic worms are extremely popular and are one of the most versatile lures out there. Plastic worms produce bass day in and day out, all year long, in every region of the world. Soft plastic baits can be rigged in a variety of ways such as Texas, Carolina, Wacky, Weightless, Drop Shot, or Split Shot. They can be flipped and pitched, twitched, crawled, swam, and finessed to fish them the way you want to. They can also be used to troll with or used as trailers for other lures like jigs or spinnerbaits. They come in many shapes, sizes and colors. Some styles include the straight tail, shaky head, curly tail, split tail, paddle tail, and doodle worm. Some of the popular sizes range from 4-6 inches and well above 10 inches. Some popular colors may include green pumpkin, pumpkin seed, purple, black, brown, or smoke. These are just a few options which would go nice in any bass anglers tackle box collection. Crankbaits are another that attracts bass all year long in all weather conditions. They are very versatile and very easy to master. They can be found in many shapes, sizes and colors. Some are made to run shallow or deep. Lipless or large billed. Thin to wide bodied profiles. Tight wiggle for little action and little water displacement. Or wide wiggle for more action. They can be flipped into pockets and cover, or cast out far to run in deep water. They can be fished with a variety of retrieves. From fast to slow, or stop and go. Some will float up on the pause, while others can sit still like a jerk bait is capable of doing. Spinnerbaits and buzzbaits are a great way to quickly cover a lot of territory. It makes it hard for aggressive bass to pass up. 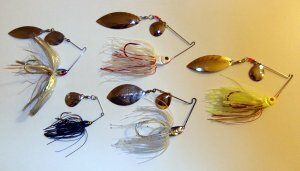 And the wide variety of styles to choose from makes it hard for the bass fisherman to pass up. Some of the most popular skirt colors are chartreuse or whites, with or without red streaks. The most common blades are usually the Colorado blade, the Willowleaf blade and the Indiana blade. They can be used as a single, double or mix matched. As with the spinnerbait itself and the skirts, they come in a variety of colors and sizes which should be matched together accordingly. Other cool options could be to add a trailer hook, or even a plastic trailer like a worm or grub. These can be fished fast or slow. And can be flip into heavy cover or twitched and jerked, or paused to allow the blades to flutter on the fall. Since these are nearly weedless, they are ideal for banging through and around heavy structure, bouncing them off of rocks and wood pilings. Jigs are a favorite to many serious bass anglers. Some even believe they are at the very top of bass fishing best lures. After all, they are just as versatile as the plastic worm, but with a larger profile. There are so many options with jigs. Skirts can be changed out to different colors and the lengths can vary with the options of customizing them. The jig heads come in different shapes, sizes, colors and weights. They have single or double hooks. Or you can add a trailer hook or a soft plastic trailer to add to its profile. The hook guards allow them to be snag proof for the most part so they are more capable of being fished in heavy structure and vegetation. They can be slowly crawled along the bottom, bounced off rocks, or even swam. Have a look at these jig fishing tips for some sweet ways on fishing them. New and improved styled swimbaits are taking the world of bass fishing to another level. The Berkley Powerbait 5" Hollow Belly swimbaits are one of the hottest lures out on the market. 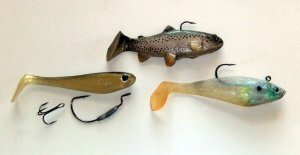 The well design, and many options for customizing them makes them one of bass fishing best lures. More importantly of course, is that they entice more bass into biting, as well as better hook sets. The hollow plastic body collapses into the hook when the bass sink their mouth onto the bait, which allows for a nice hook set without all the bulkiness of plastic getting in the way as with most older models of swimbaits. Not only that, these are able to get down deeper and into the strike zone, right in front of the bass' face. The realistic look makes it difficult for bass not to attack it. 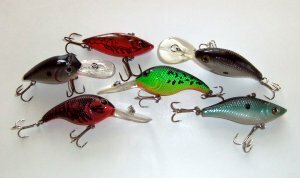 Check out our section of the best bass fishing lures to learn how to quickly determine which artificial baits to use in any type of water color condition. These are our top choices for bass fishing best lures. Feel free to cast us a line and share with us what you're busting your bass with.